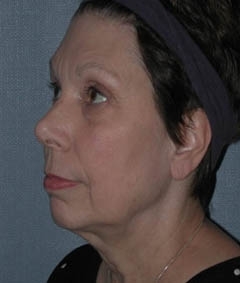 This healthy 60-year-old woman wanted to undergo a one-stage facial rejuvenation including multiple procedures such as a brow lift and face lift in St. Louis. She was referred to me by another patient who had this same procedure. She was most concerned about the sagging in her cheek and jaw areas. She did not like the loose skin in her neck, her drooping eyebrows, and the fullness in the upper eyelids. She had been treated for breast cancer five years ago, and had a lumpectomy and radiation therapy, along with removal of the lymph nodes. She had been on tamoxifen for five years and had no evidence of breast cancer. 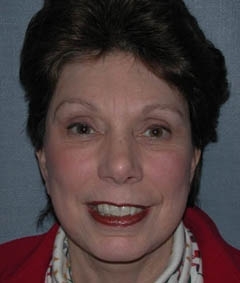 She was a schoolteacher and wanted to have the surgery performed in the summer months when she was not teaching. 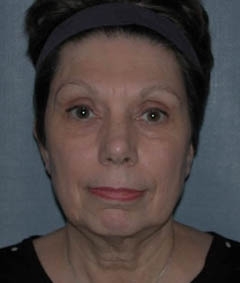 The patient underwent a forehead and brow lift along with face lift. The brow lift was performed with an endoscopic technique, which required smaller incisions. The new position on the forehead was maintained with a new absorbable device. A face lift and neck lift were performed where the tissues were repositioned and tightened and the excessive skin removed. At the end of the case, tissue in the form of fascia grafts were placed underneath the cheek folds to give a longer lasting improvement. The procedure was done under general anesthesia, and she stayed overnight and went home the next morning. Her recovery went smoothly. 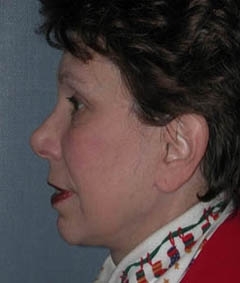 She started using the Obagi Skin Rejuvenation Program before surgery, and then restarted it after her surgery. This physician-strength skin care product line helps protect results of my St. Louis cosmetic surgery patients.